What Is a SIM Card, and Why Do We Need One? A smartphone enthusiast who has been published in several countries and languages. SIM stands for subscriber identity module or subscriber identification module. It would then follow that a SIM card contains unique information that identifies it to a specific mobile network, which allows the subscriber (like you) to use the communication features of the device. SIM also stands for 'simulation,' and might refer to a video game that simulates real life. What Is a SIM Card Used For? Some phones need a SIM card in order to identify the owner and communicate with the mobile network. So, if you have, say, an iPhone on Verizon's network, it needs a SIM card so that Verizon knows that the phone belongs to you and that you're paying for the subscription, but also so that certain features will work. The information in this article should apply to both iPhones and Android phones (no matter who made your Android phone: Samsung, Google, Huawei, Xiaomi, etc). You may have been in a situation where you get a used phone that's missing a SIM card and soon realize that it doesn't work as anything but an expensive iPod. While you might be able to use the device on Wi-Fi and to take pictures, you can't connect to any carrier's mobile internet network, send text messages, or make phone calls. Some SIM cards are mobile, which means if you put it in an upgraded phone you just purchased, the phone number and carrier plan details will now "magically" start working on that phone. On that note, if your phone runs out of battery and you desperately need to make a phone call, and you have a spare around, you can just put the SIM card into the other phone and immediately use it. The SIM also contains a small amount of memory which can store up to 250 contacts, some SMS messages and other information used by the carrier who supplied the card. In many countries, SIM cards and devices are locked to the carrier they are purchased from. This means that although a SIM card from a carrier will work in any device sold by that same carrier, it will not work in a device that's sold by a different carrier. It is usually possible to unlock a cell phone with help from the carrier. Does My Phone Need a SIM Card? You might have heard the terms GSM and CDMA in relation to your smartphone. GSM phones use SIM cards while CDMA phones do not. If you're on a CDMA network like Verizon Wireless, Virgin Mobile, or Sprint, your phone might use a SIM card but the identification features explained above are not stored on the SIM. This means if you have a new Verizon phone that you want to start using, you can't just put your current SIM card into the phone and expect it to work. So, for example, putting your broken Verizon iPhone's SIM card into a working iPhone does not mean you can just start using the new iPhone with Verizon. To do that, you'd have to actually activate the device from your Verizon account. In these instances with CDMA phones, the SIM card is most likely used because the LTE standard requires it, or because the SIM slot can be used with foreign GSM networks. However, the SIM card on GSM phones can be swapped with other GSM phones no problem, and the phone will work just fine on that GSM network that the SIM is tied to, like T-Mobile or AT&T. This means you can remove the SIM card in one of your GSM phones and put it into another and keep using your phone's data, phone number, etc., all without having to get approval through the carrier like you have to when using Verizon, Virgin Mobile, or Sprint. Originally, cell phones which used the CDMA network rather than the GSM network did not use a removable SIM card. Instead, the device itself would contain the identifying numbers and other information. This meant that CDMA device could not easily be switched from one carrier network to another, and could not be used in many countries outside the US. More recently, CDMA phones have begun to feature a Removable User Identity Module (R-UIM). This card looks almost identical to a SIM card and will work in most GSM devices. What Does a SIM Card Look Like? A SIM card just looks like a small piece of plastic. The important part is a small integrated chip which is able to be read by the mobile device it's inserted into, and contains a unique identification number, the phone number, and other data specific to the user that it's registered to. The first SIM cards were roughly the size of a credit card and were the same shape around all the edges. Now, both Mini and Micro SIM cards feature a cut-off corner to help prevent incorrect insertion into the phone or tablet. 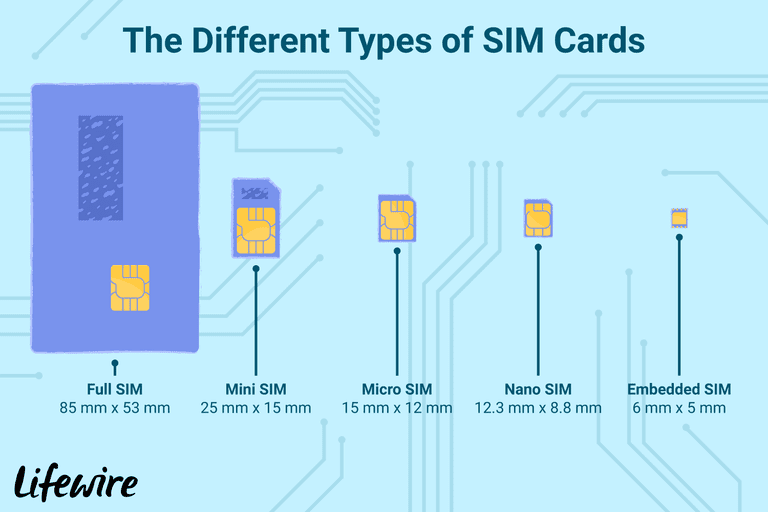 Here are the dimensions of the different types of SIM cards. If you have an iPhone 5 or newer, your phone uses a Nano SIM. The iPhone 4 and 4S use the larger Micro SIM card. Samsung Galaxy S4 and S5 phones use Micro SIM cards while the Nano SIM is necessary for Samsung Galaxy S6 and S7 devices. See SIM Local's SIM Card Sizes table to find which type of SIM your phone uses. A Mini SIM card can actually be cut to turn it into a Micro SIM, as long as it's only the plastic surrounding that's cut. Despite differences in size, all SIM cards contain the same types of identifying numbers and information on the small chip. Different cards do contain different amounts of memory space, but this has nothing to do with the physical size of the card. Where Do I Get a SIM Card? You can get a SIM card for your phone from the carrier that you subscribe to. This is usually done through customer service. For example, if you have a Verizon phone and need a Verizon SIM card, you can ask for one in a Verizon store or request a new one online when you add a phone to your account. How Do I Remove or Insert a SIM Card? The process to replace a SIM card varies depending on your device. It might be stored behind the battery, which is only accessible through a panel at the back. However, some SIM cards are accessible on the side of the phone. The SIM card for your specific phone might be one where you have to pop it up out of its slot with something sharp like a paperclip, but others might be easier to remove where you can just slide it out with your finger. If you need help switching out the SIM card on your iPhone or iPad, Apple has instructions here. Otherwise, refer to your phone's support pages for specific instructions. Ever Heard of CDMA When Talking About Phones? What is GSM, EDGE, CDMA and TDMA for Cellphones? What Is an Unlocked Cell Phone or Smartphone? What's a Mobile Network, and How Does It Work? Can I Use My Smartphone When Traveling to Another Country? Google Project Fi — Would It Save You Money? What is a Personal VPN Service and Why Do I Need One? How Do I Swap Batteries and Cards for the Samsung Galaxy S Vibrant?